Bruxism is excessive grinding of the teeth and/or excessive clenching of the jaw. Bruxism is an oral parafunctional activity; i.e., not an activity related to normal function such as eating or talking. Bruxism is a common problem: reports of prevalence range from 8–31% in the general population. They are called many names: the occlusal guard, night guard, nocturnal bite plate, dental guard, night guard for teeth grinding, and bite splint are the most common terms used. A true custom fit mouth guard for teeth grinding is made by taking a dental impression of your teeth. A stone replica of your exact dental anatomy is then made from your impression. The difference between a custom made dental guard and a stock type that you would by in the store is quite significant. The main problem with the “one size fits all” type is that mouths (in general) are not one size. Men typically have bigger mouths than women. A teenager vs an adult is going to be a completely different size. The arch of teeth can vary greatly from person to person. So when you buy an over the counter type (even the boil & bite guards), disappointment usually follows. Most common complaints include being “too bulky”, “uncomfortable to sleep in”, “falls out during the night” etc. If you must wear a night guard for teeth grinding (and let us warn you, if you are grinding/clenching your teeth night after night, you really do need to be wearing a night guard) your best bet is to get professionally fitted and have a custom night guard made from your dentist. When you start to shop for a custom night guard, you may become confused about which one to choose. How do you know if you need a hard type or a soft type? What if you grind your teeth during the day? Do you need to be wearing a day time guard as well? Most of all, will any of these guards be comfortable enough during sleep? So how do you know if you need a hard night guard or a soft one? You should seek to evaluate your own teeth grinding habits and make a guided choice based on what you know about your own particular situation. Establish what type of teeth grinder/jaw clencher you are. A dentist can look at your teeth and tell you if you’re doing short & long term damage to your teeth. Instinctively, you may also know if you’re doing some serious damage to your teeth. If you wake up every day (for instance) with mouth/jaw/teeth soreness and a headache, you should look into purchasing a night guard. Soft mouth guards made of 2mm thick soft, plastic material is usually the best candidate for light bruxism and clenching. The soft plastic material provides extra cushioning to prevent jaw pain from clenching while also helping to protect the enamel from grinding for 6 months to 2 years. The heaviest teeth grinding requires the thickest, strongest custom dental night guard. These durable guards usually last 2-5 years and are made of 2-3mm thick rigid acrylic. 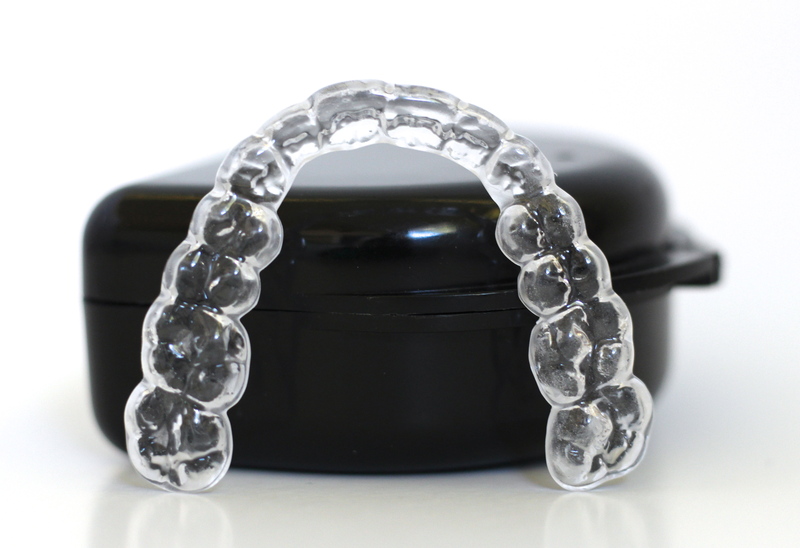 Though they are typically the most expensive dental night guards, if you are suffering from severe bruxism, or TMD these heavier guards are the best way to protect your tooth enamel over time. A hard acrylic dental guard does not allow much “wiggle room” for ANY changes to the teeth. So think about this when you’re making your decision. 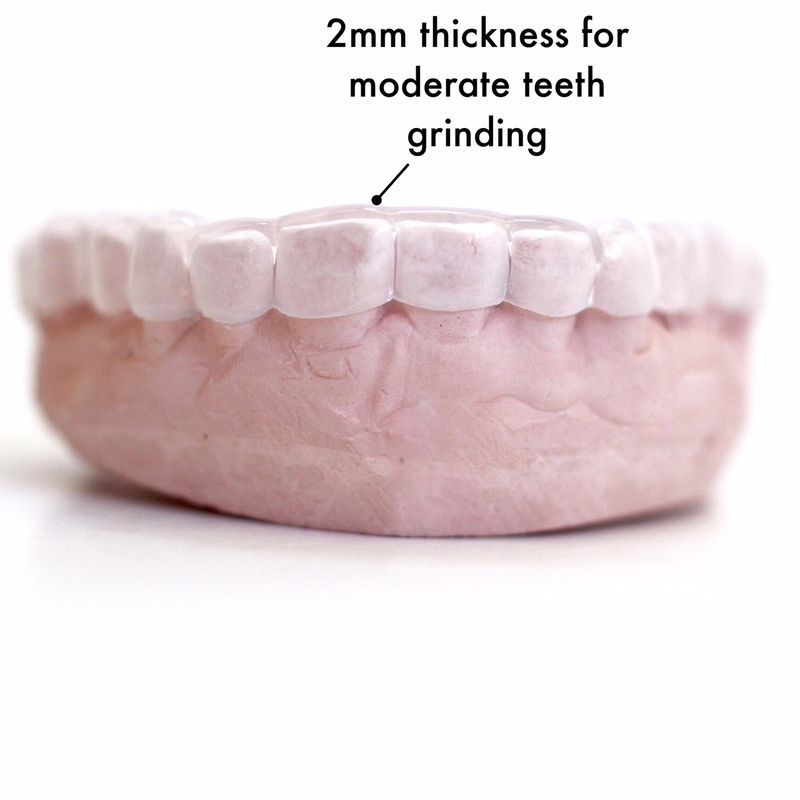 If you plan on having work done in the future that could change your dental anatomy (new crown, bridge, bonding, implants, veneers, even cavities being filled could alter your anatomy enough to change how your night guard fits) consider getting a night guard made for the opposing arch. In addition to wearing a hard night guard, you may need to seek additional treatment (if suffering from TMJ). In some cases, a special type of night guard that could involve ramps and/or metal clasps may need to be made from your dentist/TMJ specialist. If you’re experiencing alignment issues or if you know you suffer from TMJ please consult with a dentist before ordering a night guard.